• For quantitative determination of acetylcholinesterase activity and evaluation of acetylcholinesterase inhibitors. • Sensitive and accurate. Detection range 10 to 600 U/L AChE activity in 96-well plate assay. • Convenient. The procedure involves adding a single working reagent, and reading the optical density at 2 min and 10 min at room temperature. • ACETYLCHOLINESTERASE (EC 3.1.1.7, AChE), also known as RBC cholinesterase, is found primarily in the blood and neural synapses. Low serum cholinesterase activity may relate to exposure to insecticides or to one of a number of variant genotypes. AChE catalyzes the hydrolysis of the neurotransmitter acetylcholine into choline and acetic acid, a reaction necessary to allow a cholinergic neuron to return to its resting state after activation. Cholinesterase levels of cells and plasma are used as a guide in establishing safety precautions relative to exposure and contact, as well as a guide in determining the need for workers to be removed from areas of contact with the organic phosphate insecticides. Simple, direct and automation-ready procedures for measuring AChE activity are very desirable. BioAssay Systems QuantiChrom™ Acetylcholinesterase Assay is based on an improved Ellman method,in which thiocholine produced by the action of acetylcholinesterase forms a yellow color with 5,5’-dithiobis(2-nitrobenzoic acid). The intensity of the product color, measured at 412 nm, is proportionate to the enzyme activity in the sample. 1. 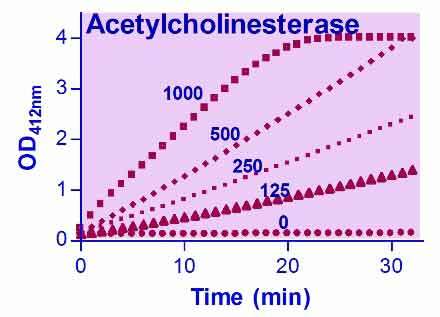 Does the assay detect only acetylcholinesterase activty? No, this assay detects acetylcholinesterase and butyrylcholinesterase (also known as plasma cholinesterase, pseudocholinesterase) and does not distinguish between the two. 2. Which anticoagulant should I use for blood sample collection? We recommend using serum for measuring plasma cholinesterase activity and EDTA blood for measuring red blood cell acetylcholinesterase activity. 1. Basselin, M et al (2009). Acute but not chronic donepezil increases muscarinic receptor-mediated signaling via arachidonic acid in unanesthetized rats. J Alzheimers Dis. 17(2):369-82. Assay: Acetylcholinesterase in Rat cerebral cortical tissues (Pubmed). 2. Al-Akwa, AA et al (2009). Free radicals are present in human serum of Catha edulis Forsk (Khat) abusers. J Ethnopharmacol. 125(3):471-3. Assay: Acetylcholinesterase in Human serum (Pubmed). 3. Ng, J et al (2011). Autonomic remodeling in the left atrium and pulmonary veins in heart failure: creation of a dynamic substrate for atrial fibrillation. Circ Arrhythm Electrophysiol.4(3):388-96. Assay: Acetylcholinesterase in Dog explanted atria (Pubmed). 4. Ahmad, MZ et al (2015). Impact of chlorpyrifos on health biomarkers of broiler chicks. Pestic Biochem Physiol. 122:50-8. Assay: Serum in Broiler birds (Pubmed).